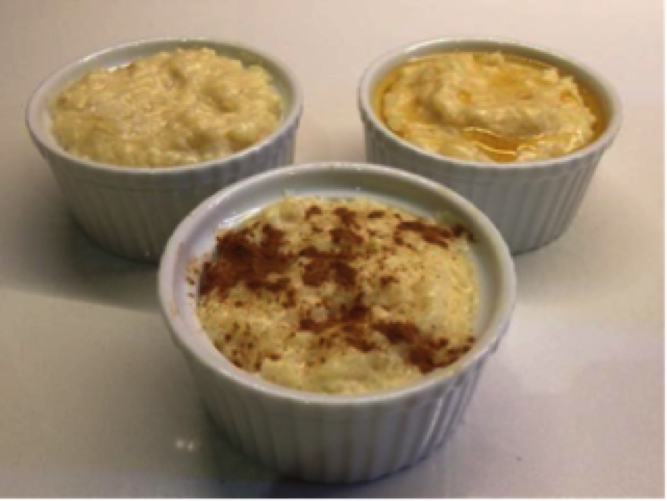 One of the yummy dishes my mother cooked for us as children, and now for her Grandchildren, is the traditional Greek rice pudding, known as Rizogalo. Not only is this dish simple to make and tastes yummy, it can be nutritious (high in protein and calcium), served as a snack or as a dessert, for children and adults alike, but it can also be modified to suit the low FODMAP diet. You can also create your own version by using a number of different toppings – it doesn’t need to have the traditional Greek topping of cinnamon. ENJOY! Pour lactose-free milk into a medium-large sized saucepan. Place saucepan onto a stove top and allow lactose-free milk to almost reach boiling point. Then reduce the heat, add in the rice and allow to simmer. Add in 1 tablespoon of raw sugar to the milk-rice mixture and stir through. 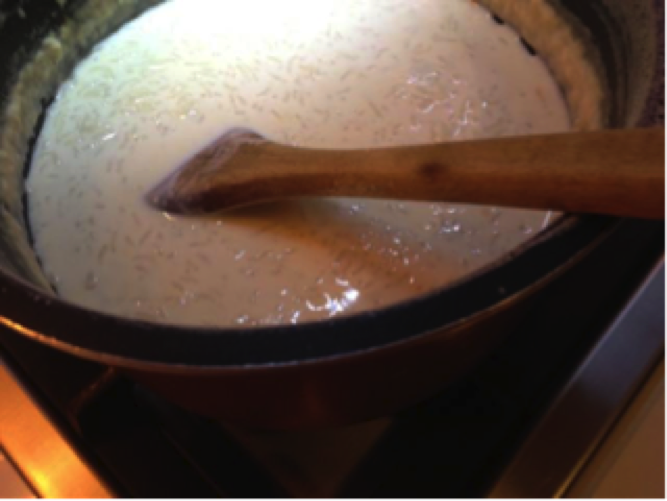 Continue stirring frequently for approximately 20 minutes until the rice is tender and the mixture has thickened to your liking.If mixture is too thick you can add more milk. If mixture is too runny continue cooking – it will thicken up. Keep stirring frequently so that the milk doesn’t burn and to avoid rice pudding sticking to the bottom. Once cooked, remove rice pudding from saucepan. Serve it hot with a sprinkle of cinnamon on top. If some children are a little fussy and don’t like the sprinkled cinnamon on top, but everyone likes the flavour – you can add a cinnamon stick into the milk and rice mix while cooking and remove it before serving. If you add a sweet topping, you may not need to include the sugar during the cooking process. 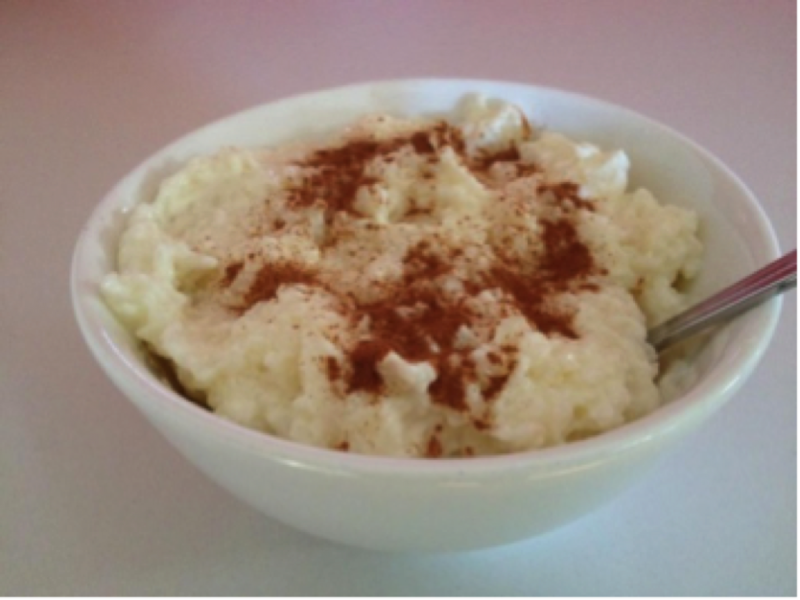 If you don’t serve the rice pudding immediately it will form a crust layer on top – but you can stop this by cooling the mixture right away.Place the rice pudding into a bowl, then sit the bowl inside another bowl of ice.Stir the mixture until it’s cooled. Serve cold immediately, or place in the fridge for later. If refrigerated within 2 hrs of cooking this dish will keep in the fridge for 3 days.